Wash salad and drain off, place in a mixing bowl. Place frying pan onto a high heat and add 2 tbsp of oil. When it starts to smoke add seasoned steak and sear hard on both sides until coloured on both sides. Remove pan from the heat and add thyme and butter to the pan, flipping the steak and basting. Remove from heat and place steak onto a plate to rest, pouring over all the cooking juices and butter. In a mixing bowl whisk together mustard, 5 tbsp oil and vinegar. Toss into mixed leaves and add in the pickled beetroot and blue cheese. 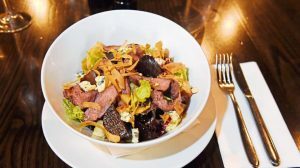 After resting the steak slice thinly and scatter over the salad, finish with spooning cooking juices and walnut croutons.